The Surfers Paradise Street Circuit is a temporary street circuit at Surfers Paradise, in South East Queensland, Australia. The challenging 4.47-kilometre (2.78 mi) track has several fast sections and four chicanes. 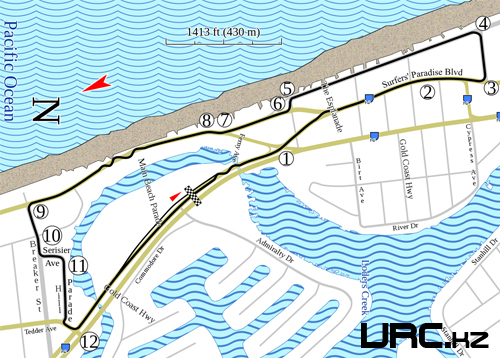 It is the third of three motor racing circuits that have existed in the Surfers Paradise area, after the Southport Street Circuit (1954) and Surfers Paradise International Raceway (1966–1987). Ron Dickson, the president of D3 Motorsport Development held the rights for Champ Car internationally in the 1980s. After a brief meeting with State Premier Joh Bjelke-Petersen the event was confirmed for Queensland, and Surfers Paradise was chosen over Brisbane. The circuit currently hosts the Gold Coast 600 event of the V8 Supercars championship.